The National Broadcasting Company's NBC Radio Network (known as the NBC Red Network prior to 1942) was an American commercial radio network, founded in 1926. Along with the NBC Blue Network it was one of the first two nationwide networks established in the United States. Its major competitors were the Columbia Broadcasting System (CBS), founded in 1927, and the Mutual Broadcasting System, founded in 1934. In 1942, NBC was required to divest one of its national networks, so it sold NBC Blue, which was soon renamed the American Broadcasting Company (ABC). After this separation the Red Network continued as the NBC Radio Network. In 1987 NBC sold its remaining radio network operations to Westwood One, which continued using NBC identification for some of its programming until 2014. Beginning in 2016, NBC Radio News has been distributed in conjunction with iHeartMedia. 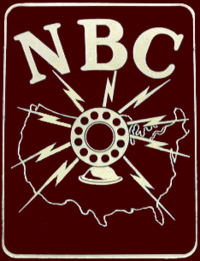 The 1926 formation of the National Broadcasting Company was a consolidation and reorganization of earlier network radio operations developed by the American Telephone & Telegraph Company (AT&T) beginning in 1922, in addition to more limited efforts conducted by the "radio group" companies, which consisted of the Radio Corporation of American (RCA) and its corporate owners, General Electric (GE) and the Westinghouse Electric & Manufacturing Company. Organized radio broadcasting started in the early 1920s. AT&T soon became an industry leader, and in 1920 and 1921 it concluded a series of patent cross-licensing agreements with the "radio group" companies. Under these agreements AT&T asserted that it held the sole right to sell commercial time on radio stations, which it called "toll broadcasting", although for the next few years the idea of radio advertising would be controversial. AT&T also recognized that its longline telephone network could be used to connect radio stations together to form networks to share programming and costs. In early 1922 AT&T announced the establishment of a "toll" station in New York City, WEAF (now WFAN), plus its intention to develop a nationwide commercial radio network. WEAF would serve as the key station for AT&T's network development. Although the original plan was to build additional stations throughout the United States, the "broadcasting boom" of 1922 resulted in a total of over 500 assorted broadcasting stations by the end of the year, so AT&T only found it necessary to build one additional outlet, WCAP in Washington, D.C., owned by its Chesapeake & Potomac subsidiary. AT&T's radio network, commonly called the "WEAF chain", was first developed in the northeastern United States. The first joint broadcast was a one-time effort made on January 4, 1923, when a program originating at WEAF was also broadcast by WNAC (now WRKO) in Boston, Massachusetts. The first continuous link was established during the summer of 1923, when Colonel Edward H. R. Green arranged for AT&T to provide WEAF's programming for rebroadcast by his station, WMAF at South Dartmouth, Massachusetts. The first transcontinental link was made in early 1924, and that fall a coast-to-coast network of 23 stations broadcast a speech by President Coolidge. By the end of 1925 there were 26 affiliates in the standard WEAF Chain, extending west to Kansas City, Missouri. In 1926, AT&T centralized its radio operations in a new subsidiary known as the Broadcasting Company of America. Although not widely known at the time, this was done in anticipation of selling the radio network, the result of a management decision that the radio operations were incompatible with the company's primary role as the leading U.S. supplier of telephone and telegraph services. The "radio group" quickly recognized the value of network programming, but was badly handicapped in its attempts to effectively compete. AT&T's assertion that only it could sell radio advertising meant that the radio group stations had to be commercial-free, and thus were financed by their owners, which soon became a major drain on company profits. The radio group efforts would be centered on WJZ (now WABC), a Newark, New Jersey station which RCA acquired in 1923 from Westinghouse and moved to New York City. The same year, RCA built WRC (now WTEM) in Washington, D.C., and much of its early efforts involved linking these two stations. However, AT&T generally refused access to its high-quality telephone lines to competitors, so these efforts generally tried to use telegraph lines, which were found to be incapable of good quality audio transmissions. Use of high-powered stations and shortwave connections was also investigated, but none of these approaches matched the reliability and quality of AT&T's telephone links. The first RCA network broadcast occurred in December 1923, when a WJZ program was rebroadcast by General Electric's WGY at Schenectady, New York. The "WJZ chain" saw little growth compared to AT&T's success. President Coolidge's March 1925 inaugural speech was sent over a growing AT&T transcontinental network of 23 stations, but the WJZ chain's broadcast of the speech was carried by only four stations, all located in the East. A few weeks after AT&T consolidated its radio operations in the Broadcasting Company of America subsidiary, it made an agreement to sell the assets to RCA for approximately one million dollars. This sale transferred ownership of WEAF to RCA, and included with the purchase was an agreement by AT&T to make its telephone lines readily available for networking. On September 13, 1926, RCA chairman of the board Owen D. Young and president James G. Harbord announced the formation of the National Broadcasting Company, Inc., to begin operations upon RCA's acquisition of WEAF on November 15. A widely placed full-page company advertisement stated that: "The purpose of the National Broadcasting Company will be to provide the best program available for broadcasting in the United States. ... It is hoped that arrangements may be made so that every event of national importance may be broadcast widely throughout the United States." As part of a renegotiation of the cross-licensing agreements, NBC was also permitted to accept advertising. NBC's network operations were officially launched with a gala broadcast beginning at 8 p.m. Eastern on November 15, 1926. In anticipation, one newspaper reported: "The most pretentious broadcasting program ever presented, featuring among other stars of the theatrical, concert and radio field, some of whom have never been heard on the air, will mark the introduction of the National Broadcasting company to the radio public Monday evening", with NBC president Merlin H. Aylesworth characterizing the event as "a four-hour program beginning at 8 o'clock, which will live long in their memories as an occasion marking another milestone in the history of radio broadcasting". Carl Schlegel of the Metropolitan Opera opened the inaugural broadcast, which also featured Will Rogers and Mary Garden. This broadcast, which included a remote link from KYW in Chicago, was coordinated through WEAF, and carried by twenty-two eastern and Midwestern stations, located as far west as WDAF in Kansas City, Missouri. NBC Red/Blue's secondary 1930s’ logo, commonly seen on the network's microphone flags. On January 1, 1927, NBC formally divided its programming into two networks, called the Red and the Blue. Legend has it that the color designations originated from the push-pins early engineers used to mark affiliates of WEAF (red pins) and WJZ (blue pins), or from the use of double-ended red and blue colored pencils. The two NBC networks did not have distinct identities or "formats", and, beginning in 1929, they shared use of the distinctive three-note "NBC chimes". The NBC Red Network, with WEAF as its flagship station and a stronger line-up of affiliated stations, often carried the more popular, "big budget" sponsored programs. The Blue Network and WJZ carried a somewhat smaller line-up of often lower-powered stations and sold air time to advertisers at a lower cost. NBC Blue often carried newer, untried programs (which, if successful, often moved "up" to the Red Network), lower cost programs and unsponsored or "sustaining" programs (which were often news, cultural and educational programs). In many cities in addition to New York, the two NBC affiliated stations (Red and Blue) were operated as duopolies, having the same owners and sharing the same staff and facilities. At this time, most network programs were owned by their sponsors and produced by advertising agencies. The networks had limited control over their schedules, as advertisers bought available time periods and chose which stations would carry a program regardless of what other sponsors might broadcast in other time periods. Networks rented out studio facilities used to produce shows and sold air-time to sponsors. The only network-produced programs were unsponsored programs used to fill unsold time periods (affiliated stations had the option to "break away" from the network to air a local program during these periods) but the network had the "option" to take back the time period if a network sponsor wanted the time period. On April 5, 1927 NBC reached the West Coast with the launching of the NBC Orange Network, which rebroadcast Red Network programming to the Pacific states and had as its flagship station KGO in San Francisco. NBC Red then extended its reach into the Midwest by acquiring two 50,000–watt clear-channel signals, Cleveland station WTAM on October 16, 1930 and Chicago station WMAQ (coincidentally, a CBS Radio Network charter affiliate) by 1931. On October 18, 1931, Blue Network programming was introduced along the NBC Gold Network, which broadcast from San Francisco's KPO. In 1936 the Orange Network name was dropped and affiliate stations became part of the Red Network. The Gold Network adopted the Blue Network name. In a major move in 1931, RCA signed crucial leases with the new Rockefeller Center management that resulted in it becoming the lead tenant of what was to become in 1933 its corporate headquarters, the RCA Building, at 30 Rockefeller Plaza. Under the terms of the lease arrangement, this included studios for NBC and theaters for the RCA-owned RKO Pictures. The deal was arranged through the Center's founder and financier, John D. Rockefeller, Jr., with the chairman of GE, Owen D. Young, and the president of RCA, David Sarnoff. By 1939, the Red and Blue networks were competing with CBS and Mutual in providing nationwide coverage. NBC advertising rate cards of the period listed "basic" and "supplemental" affiliated stations. Advertisers were encouraged to buy time for their programs on the full "basic" line-up (plus any "supplemental" stations they wished) but this was open to negotiation. It was not unusual for Red Network advertisers to place shows on Blue Network stations in certain markets (and the other way around). Supplemental stations were generally located in smaller cities away from the network trunk lines. Such stations were usually offered to advertisers on both the Red and Blue Network line-ups. As of early 1939, the Red Network was divided into five geographical regions. The East consisted of 16 basic and 16 supplemental stations; the Midwest had 8 basic and 15 supplemental stations; the South had 7 basic and 30 supplemental stations; Mountain had 2 basic and 9 supplemental stations, and Pacific had 5 basic and 7 supplemental stations. For example, in Louisville, KY, a larger market, the basic station was WAVE (AM), the supplemental was WGRC (AM)-also a primary Mutual Broadcasting System affiliate. Concerned that NBC's control of two national radio networks gave it too much power over the industry, in May 1941 the Federal Communications Commission (FCC) promulgated a rule designed to force NBC to divest one of them. RCA fought the divestiture order, but divided NBC into two companies in case an appeal was lost. The Blue network became the "NBC Blue Network, Inc." and the NBC Red became "NBC Red Network, Inc." Effective January 10, 1942, the two networks had their operations formally divorced, and the Blue Network was referred to on the air as either "Blue" or "Blue Network," with its official corporate name being Blue Network Company, Inc. NBC Red, on the air, became known as simply NBC on September 1, 1942. The FCC order was ultimately upheld by the U.S Supreme Court, and on October 12, 1943, the Blue network was sold to candy magnate Edward J. Noble for $8,000,000, and renamed "The Blue Network, Inc." In 1946 the name was changed to the American Broadcasting Company. The "Red" network retained the NBC name, and remained under RCA ownership. NBC and RCA were one of the key forces in the development of television in the 1930s and 1940s, dating back to New York City experimental station W2XBS in 1928. Before the American entry into World War II in 1941, W2XBS was officially licensed as WNBT. By the late 1940s, NBC would complement most of its owned-and-operated stations with an adjunct FM signal and a television counterpart. By the end of 1950, NBC's owned-and-operated stations were located in New York City (WNBC-AM-FM, changed from WEAF in 1946, and WNBT); Chicago (WMAQ-AM-FM and WNBQ); Cleveland (WTAM-AM-FM and WNBK); Washington, D.C. (WRC-AM-FM and WNBW); Los Angeles (KNBH television); Denver (KOA, purchased in 1941 and KOA-FM); and San Francisco (KNBC-AM-FM). NBC sold its Denver stations to a group that included one of its radio stars, Bob Hope, in 1952. For two decades the NBC radio network's roster of stars provided ratings consistently surpassing those of CBS, its main competitor. But in 1948, as the transition from radio to television was beginning, NBC's leadership came under attack due to what became known as the "Paley raids", named after the president of CBS, William S. Paley. After World War II the tax rate for annual incomes above $70,000 was 77%, while capital gains were taxed at 25%. Paley worked out an accounting technique whereby individual performers could set up corporations that allowed their earnings to be taxed at the significantly lower rate. Instead of NBC responding with a similar package, RCA's president, David Sarnoff, decided that this accounting method was legally and ethically wrong. NBC's performers did not agree, and most of the top stars, including Amos and Andy, Jack Benny, Red Skelton, Edgar Bergen, Burns and Allen, Ed Wynn, Fred Waring, Al Jolson, Groucho Marx and Frank Sinatra moved from NBC to CBS. As a result, in 1949 CBS now boasted of having sixteen of the twenty top rated programs. The consequences would carry over to television, where CBS maintained its newfound dominance for decades. Paley had personally worked to woo the performers, while Sarnoff professed his indifference to the defections, stating at an annual meeting that "Leadership built over the years on a foundation of solid service cannot be snatched overnight by buying a few high-priced comedians. Leadership is not a laughing matter." Many NBC radio stars gravitated to television as it became more popular in the 1950s. Toscanini made his ten television appearances on NBC between 1948 and 1952. In 1950, the radio network sanctioned The Big Show, a 90-minute variety program that harked back to radio's earliest musical variety style but with sophisticated comedy and drama and featuring stage legend Tallulah Bankhead as its host. It aimed to keep classic radio alive as television matured and to challenge CBS's Sunday night lineup—much of which had jumped there from NBC in the late 1940s, including (and especially) Jack Benny. But The Big Show's initial success didn't last despite critics' praises; the show endured only two years, with NBC said to lose a million dollars on the project. To reflect RCA's ownership, in October 1954 some of NBC's radio and television stations' call letters were changed to "RCA"-derived callsigns. WNBC/WNBT in New York became WRCA-AM-FM-TV, WNBW television in Washington became WRC-TV, and KNBH television in Los Angeles became KRCA. By 1960, the New York flagship radio outlets reverted to WNBC-AM-FM and the television station became WNBC-TV. In 1962 KRCA in Los Angeles became KNBC (TV), while the former KNBC-AM-FM in San Francisco became KNBR-AM-FM. WNBQ television in Chicago would become WMAQ-TV in 1964. During this period NBC Radio purchased three additional stations: WKNB in New Britain, Connecticut in late 1956; and WJAS and WJAS-FM in Pittsburgh, in 1957. The acquisition of WJAS was made to offset the defection of KDKA from the network several years earlier, while WKNB was included as part of the sale of its sister television station. NBC had no interest in owning a daytime-only station in the shadow of its powerful Hartford, Connecticut affiliate, WTIC, so the network sold WKNB in 1960, while the Pittsburgh outlets were sold in 1972. In 1956, NBC sought to get an owned-and-operated television station in the Philadelphia market, so it forced a station ownership/call sign swap with Westinghouse Broadcasting. NBC acquired Westinghouse's KYW radio and WPTZ television in Philadelphia (which became WRCV-AM-TV, for the "RCA Victor" record label) while Westinghouse received NBC's WTAM-AM-FM and WNBK television in Cleveland (all of which took the KYW call signs). Westinghouse also received $3 million in cash compensation. After Westinghouse expressed its unhappiness with the arrangement, the United States Department of Justice took NBC to court in late 1956. In a civil antitrust lawsuit filed against NBC and RCA, Westinghouse claimed the network threatened to pull their TV affiliation from Westinghouse's Philadelphia and Boston stations, and withhold an affiliation from their Pittsburgh TV property if Westinghouse did not agree to the trade. In August 1964 NBC's license for WRCV radio and television was renewed by the FCC—but only on the condition that the 1956 station swap be reversed. Following nearly a year of appeals by NBC, the Supreme Court declared the trade null and void in June 1965; the KYW call letters were moved back to Philadelphia with Westinghouse while NBC rechristened the Cleveland stations as WKYC-AM-FM-TV, a derivative of KYW. NBC kept ownership of the Cleveland radio stations until 1972 before selling them off to Ohio Communications; the AM station reverted to its original WTAM call sign in July 1996. In 1957, NBC Radio won the rights to broadcast the Major League Baseball All Star Game and World Series from Mutual Radio, who had held exclusive rights since 1942 and 1939 respectively for both events. It gave NBC sole control of the big events in baseball as they had been exclusively airing both the All Star Game and World Series on television since 1947. NBC ended its radio association with baseball after the 1975 season in order to clear space for its 24-hour "News And Information" service programming, though it would continue broadcasting on the television side until 1989 (while splitting coverage with ABC in all but the first year of that period). NBC Radio's last major programming push, in 1955, was Monitor, a continuous, all-weekend mixture of music, news, interviews and features with a variety of hosts, including such well-known television personalities as Dave Garroway, Hugh Downs, Ed McMahon, Joe Garagiola and Gene Rayburn. The potpourri also tried to keep vintage radio alive in featuring segments from Jim and Marian Jordan (in character as Fibber McGee and Molly), Ethel and Albert and iconoclastic satirist Henry Morgan. Monitor was a success for a number of years, but after the mid-1960s, local stations, especially in larger markets, became increasingly reluctant to break from their established formats to run non-conforming network programming. After Monitor went off the air in early 1975, there was little left of NBC Radio beyond hourly newscasts, news-related features and the half-hour-long Sunday morning religious program The Eternal Light. This, combined with ABC Radio's split into four separate radio services in 1968, left NBC outnumbered with their affiliate count in comparison to ABC, CBS Radio and Mutual. In 1975, NBC made a major investment with the introduction of the NBC News and Information Service (NIS), which provided up to 55 minutes of news per hour around the clock to local stations that wanted to adopt an all-news format. Corporate control meant that NIS was picked up by NBC's FM stations in New York (WNBC-FM, which became WNWS), Chicago (WJOI, the former WMAQ-FM which was renamed WNIS) and San Francisco (KNAI, the former KNBR-FM). WRC in Washington also became an affiliate, migrating its Top 40 format to FM sister station WKYS (which would be blown up weeks later in favor of disco music). Other major affiliates included WBAL-FM in Baltimore, KHVH in Honolulu, and KQV in Pittsburgh. The NIS service attracted several dozen subscribers, but not enough to allow NBC to project that it would ever become profitable, and it was discontinued after two years. (KQV retained its all-news formats with local production until the end of 2017.) After the demise of NIS, NBC installed a talk radio format at WRC and went with music on the FMs in New York, Chicago, and San Francisco, respectively renaming them as WYNY, WKQX, and KYUU. Near the end of the 1970s, NBC started "The Source", a modestly successful secondary network that provided news and short features to FM rock stations. In 1981, NBC created NBC Talknet, an advice-oriented talk radio network designated for the late night hours. It was one of NBC's most successful ventures in years and lasted well into the 1990s, led by advice host Sally Jessy Raphael (until her 1987 departure) and personal finance talker Bruce Williams. NBC Radio's logo from 1979 until 1986, utilizing the "Proud N" NBC-TV logo. NBC made its final radio station acquisition in 1983 when it bought Boston beautiful music outlet WJIB from General Electric, which was divesting itself of its radio properties. In February 1984, the network sold WRC in Washington to Greater Media for $3.6 million. WRC was later rechristened WWRC, and this sale ultimately would be the start of NBC's exit from the radio business altogether. General Electric (GE) reacquired NBC's parent company, RCA, in early 1986. Shortly thereafter, GE announced its intention to sell off the entire radio division, and the NBC-owned stations were sold to various buyers over the next two years. This action was due to three main reasons. First, the radio network and station group had struggled to make a profit for the past several years (compounded by flagship station WNBC having been in a severe ratings crisis due to a dayparted patchwork format). Second, FCC ownership rules at the time did not allow a new owner outside of broadcasting – General Electric was a manufacturer – to own both radio and television stations in the same market. Third, GE had already divested their existing radio properties (including the aforementioned WJIB), deciding that the radio business, as well as RCA's, did not fit their strategic objectives. The remainder of RCA was divided and spun off to Bertelsmann and Thomson SA. Prior to 1986, operating NBC Radio was done almost out of tradition by RCA and was considered to be in the "public good," an attitude that started to change with the advent of deregulation. On July 20, 1987, Westwood One acquired the NBC Radio Network programming assets, The Source and Talknet, in a $50 million deal. In 1989, the NBC Radio Network as an independent programming service ceased to exist, becoming a brand-name for Westwood One produced content. The Sunday morning religious program The Eternal Light, for years the only non-news program on the networks' lineup, also ended its long run at the same time. NBC Radio's New York news and engineering operations were moved to Arlington, Virginia and combined with the Mutual Broadcasting System, which Westwood One had acquired in 1985. However, while field reporters were shared, both networks' newscasts remained separate and distinct, with different formats and anchors. NBC Radio's logo from NBC's May 12, 1986 corporate-wide re-branding until its 2004 dissolution. Following the sale to Westwood One, a byline would be affixed in most cases. The current NBC News Radio logo is styled in the same manner. By 1992 both NBC Radio and Mutual's newscasts were further streamlined and adopted similar formats. On weekdays between 6 a.m. and 10 p.m. Eastern time each network aired its own newscasts, but a joint newscast was produced for overnights and weekends, with the only difference between the two networks consisting of the recorded introductions, commercials and concluding network identification. NBC Radio's and Mutual's separate weekend sportscasts were canceled in favor of "The Scoreboard," a generic, one-minute hourly sportscast, airing seven times each on Saturdays and Sundays. As a result, throughout the 1990s most major-market NBC Radio affiliates switched to CBS, ABC or CNN Radio offerings, leaving only small-market and rural stations or stations that aired only the network-fed commercials. The only new program introduced by NBC following the Westwood One sale was First Light hosted by Dirk Van, an early morning news magazine and talk show which complemented Mutual's like-formatted "America In The Morning". "The Source" and "Talknet" services continued for several years under the "NBC" brand, although throughout the late 1990s the latter consisted solely of Bruce Williams' talk show, and his departure from the network on June 15, 2001 marked the end of "Talknet" programming. In 1994, Westwood One entered into an operations agreement with Infinity Broadcasting, with Westwood One handling syndication for Don Imus and Howard Stern, while Infinity took over Westwood One's management, sales and operations. By December 1996, CBS's new parent company, Westinghouse, acquired Infinity for just shy of $5 billion. Thus, the descendants of all three original U.S. network companies – NBC, CBS and Mutual – had been merged. On August 31, 1998, Mutual/NBC's Arlington operation closed, leaving CBS Radio staff directly responsible for the production of "Mutual" and "NBC"-branded newscasts from CBS' New York facilities. Westwood One decided to retire the Mutual brand name as a programming service on May 17, 1999. That same day the production of "NBC"-branded newscasts were limited to weekday mornings (5 a.m. to 10 a.m. Eastern), with CNN Radio newscasts fed to affiliates during the rest of the day and on weekends. The "NBC" newscasts, still produced by CBS Radio staff, adopted a generic format, with NBC identification limited to the NBC sounder at the beginning and a closing statement that "This is the NBC Radio Network". However, Westwood One continued to promote the NBC Radio Network on its corporate website, stating that "The NBC Network delivers a large audience of adult female listeners ... comprised of Adult Contemporary, Country, Oldies, Nostalgia and Jazz music stations." In 2001 Westwood One also began to distribute Fox News Radio, in an arrangement with the Fox News Channel, with First Light host Dirk Van as the first morning-drive anchor. After that arrangement ended, Westwood One relaunched NBC News Radio on March 31, 2003, consisting of news updates read by CNBC anchors and reporters, but with the content written by Westwood One staff. (Eventually, the newscasts would come to be written and anchored by staff from NBC News and MSNBC.) In addition, these were one-minute news updates fed only on weekdays from 6 a.m. to 10 p.m. Eastern, in contrast to the original five-minute-long newscasts. The original "NBC"-branded newscasts, overlapped with NBC News Radio's newscasts until production was ended around May 2004. On October 21, 2011 Dial Global acquired the majority of Westwood One's assets, including the distribution rights to NBC News Radio, and this resulted in a wholesale re-branding of Westwood One programming. Only one program from the original NBC Radio Network remained on the air: First Light, which had the NBC peacock embedded in the show logo well into the late 1990s. After the "NBC"-branded newscasts were generally phased out, this show was primarily branded as a Westwood One production, although host Dirk Van still made the brief announcement, "From Westwood One, this is NBC Radio", at the halfway point and conclusion of every show. First Light became entirely identified as a "Dial Global Radio Network" program the next day, temporarily ending any references to NBC. On November 28, 2011, First Light once again began identifying throughout the program as coming "on NBC Radio from Dial Global/the Dial Global Radio Network". While the conclusion still aired the Dial Global network sounder (an audible chime not identifiable with NBC), this marked a re-emphasis of the "NBC" brand. On March 2, 2012, Dial Global further announced it would discontinue distributing newscasts from CNN Radio and make NBC News Radio a full-time operation. This marked the first time since 2004 that full-length radio news was presented under the NBC banner. On April 1, 2012, in a reversal of the original NBC Radio Network's dismantlement, the majority of CNN Radio affiliates were switched to NBC. The new format consisted of 6 minute on-the-hour and 3 minute on-the-half-hour newscasts. Dial Global also distributed the audio simulcast of Meet The Press, the monologues of NBC's late night television programming, CNBC radio reports, and localized forecasts for The Weather Channel, which effectively united all of NBC's programming under one syndicator. In September 2012 Dial Global affiliated its sports department with NBC Sports to launch NBC Sports Radio, a 24-hour programming service. In September 2013 Cumulus Media, after acquiring a share of the network, changed Dial Global's name to Westwood One. On December 15, 2014, concurrent with the soft launch of a news service provided by the syndicator and its Cumulus Media parent company, Westwood One again retired the NBC News Radio brand, as part of a news content/actuality sharing deal between Westwood One and CNN. For a time there were no longer any hourly "NBC Radio" newscasts, although the NBC name continued to be used for NBC Sports Radio. On December 18, 2014, First Light again discontinued on-air use of the "NBC Radio" name, switching to being branded as a Westwood One production. Beginning in July 2016, NBC News Radio broadcasts reappeared, now made available by iHeartMedia to over 1,000 "24/7 News Source" affiliates. The reintroduced service was announced to include a top-of-the-hour newscast, along with "primetime specials, political events and breaking news reports". ^ a b "Early History of Network Broadcasting (1923-1926)", Report on Chain Broadcasting, Federal Communications Commission, May 1941, pages 5-6. ^ "National Radio Broadcast By Bell System", Science & Invention, April 1922, page 1144. ^ Commercial and Broadcasting Pioneer: The WEAF Experiment, 1922-1926 by William Peck Banning, 1946, pages 288-290. ^ "Why Did WABC Have Such a Great Signal?". WABC Musicradio 77: musicradio77.com. Retrieved July 7, 2017. ^ "Setting the Pace in Radio" by Jack Binns, Popular Science, July 1924, page 65. ^ "The RCA Network", Report on Chain Broadcasting, Federal Communications Commission, May 1941, pages 6-7. ^ "To Inaugurate Radio Service", The Pittsburgh Press, September 13, 1926, page 4. ^ "Program Planned by Radio Company", The Pittsburgh Press, November 8, 1926, page 18. ^ "Radio Treat Tonight" (AP), Reading (Pennsylvania) Eagle, November 15, 1926, page 14. ^ "Network Option Time" by Elizabeth McLeod, July 15, 2000. ^ a b c d e Dunning, John (1998). On the Air: The Encyclopedia of Old-Time Radio. New York: Oxford University Press. ISBN 978-0-19-507678-3. ^ "Red and Blue Networks" by Elizabeth McLeod, February 15, 2000. ^ "Stations That Make Up the Networks", (Hagerstown, Maryland) Daily Mail, January 14, 1939, page 9. ^ Rule 3.107, Report on Chain Broadcasting, Federal Communications Commission, May 1941, page 92. ^ "NBC's KOA Sale; Now Seeks L.A. Outlet", Broadcasting - Telecasting, June 30, 1952, pg. 27. ^ "KOA Sale: NBC Approves; Transfer in Month", Broadcasting - Telecasting, September 1, 1952, pg. 27. ^ The General by Kenneth Bilby, 1986, pages 246-249. ^ "RCA Replaces NBC in O&O Calls", Broadcasting - Telecasting, October 4, 1954, pg. 78. ^ "WRCA to be WNBC? ", Broadcasting, April 4, 1960, pg. 88. ^ "KNBC to L.A.", Broadcasting, November 12, 1962, pg. 72. ^ "Media reports...", Broadcasting, August 24, 1964, pg. 79. ^ "Hearst Acquires WTVW (TV) Milwaukee; NBC buys WKNB-TV New Britain, Conn.", Broadcasting - Telecasting, January 10, 1955, pg. 7. ^ "NBC buys WJAS Pittsburgh", Broadcasting - Telecasting, August 12, 1957, pg. 9. ^ "NBC sells WNBC (TV) to Scheftel group", Broadcasting, June 29, 1959, pp. 73-74. ^ "NBC, WBC trade properties in Cleveland, Philadelphia", Broadcasting, May 23, 1955, pp. 65-66, 68. ^ "Justice Dept. hauls NBC into court", Broadcasting - Telecasting, December 10, 1956, pp. 27-32. ^ "Philadelphia circle is complete" and "Nine-year history of that trade in Philadelphia", Broadcasting, August 3, 1964, pp. 23-25. ^ "The great swap takes place June 19; Westinghouse, NBC return to original properties", Broadcasting, June 14, 1965, pg. 83. ^ "First NBC radio properties go", Broadcasting, January 17, 1972, pg. 38. ^ Halberstam, David J. (1999). Sports On New York Radio: A Play-By-Play History. McGraw-Hill. ISBN 978-1570281976. ^ "No. 2 network for NBC radio to be all news", Broadcasting, February 10, 1975, pp. 78-80. ^ "NBC news radio goes to O&Os in major cities", Broadcasting, April 21, 1975, pp. 46-47. ^ "NIS count up to 50", Broadcasting, September 29, 1975, pg. 46. ^ "NBC throws in the towel on all-news NIS", Broadcasting, November 8, 1976, pp. 34, 36. ^ "In brief", Broadcasting, May 16, 1983, pg. 104. ^ "Riding gain: Sale switch", Broadcasting, February 27, 1984, pg. 58. ^ "RCA + GE: Marriage made in takeover heaven", Broadcasting, December 16, 1985, pp. 43-45. ^ "GE/RCA go for it at FCC", Broadcasting, February 17, 1986, pg. 29. ^ "Westwood One acquires NBC Radio for $50 million", Broadcasting,, July 27, 1987, pp. 35-36. ^ "Mutual Radio Tribute Site: The Westwood One Years – 1985 to the End: Setting Sun Under Westwood One." Written by Kenneth I. Johannessen, 2009 (available online Archived July 14, 2011, at the Wayback Machine) Johannessen notes that "some information on this page came from various issues of Billboard, Broadcasting, and Radio & Records magazines; The Seattle Times, and Variety." ^ a b Westwood One – Networks – NBC. Saved on Wayback Machine, with the timestamp dating back to around 2002, three years after 24-hour programming on NBC Radio ceased. ^ "Company News; Westwood One Completes Purchase of Unistar Radio," New York Times, February 5, 1994 (available online). ^ "To Infinity and Beyond: Is a Radio Deal Too Big? ; Westinghouse Would Own 32% of Top Markets," New York Times, June 21, 1996; "Two Radio Giants to Merge, Forming Biggest Network," New York Times, June 21, 1996; "F.C.C. Approves Merger of Westinghouse and Infinity," New York Times, December 27, 1996 (available online); "Company Briefs," New York Times, January 1, 1997 (available online). ^ "First Light: Show Archives". Dial-Global. Archived from the original on November 26, 2011. Retrieved November 12, 2011. The show was re-branded as coming from "Dial Global" that October 21, but for several days, Dirk identified the show at those specified marks as "From the Dial Global Radio Networks, this is NBC Radio." The "NBC Radio" name was last used in the halfway point (17 minutes) into the October 27, 2011 program Archived April 25, 2012, at the Wayback Machine, and at the conclusion (28 minutes) of that same show, the Dial Global name and new network sounder was officially used for the first time. ^ Dial Global To Offer NBC News Radio Network, Drops CNN Radio All Access. Retrieved March 11, 2012. ^ NBC News to beef up radio news as CNN withdraws. Associated Press. Retrieved March 2, 2012.